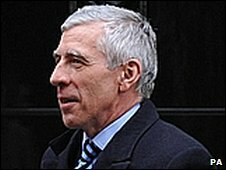 Jack Straw was guilty of a "clear, albeit inadvertent, breach" of the rules in not registering a donation for a dinner to mark 25 years as an MP. But the Committee on Standards and Privileges said that because Mr Straw had apologised and registered the money no further action was recommended. They decided on a public rebuke because Mr Straw did not register the donation until 2008 despite reminders. The justice secretary blamed the oversight on a "chapter of accidents". The complaint to the Parliamentary Commissioner for Standards was made by nearby MP Ben Wallace about the failure to register the donation of £3,000 from Canatxx to sponsor the dinner in Mr Straw's Blackburn constituency. Mr Wallace made the official complaint two years after he had correspondence with Mr Straw which led the then Leader of the Commons to conclude "in October 2006 that he should register the donation". "Unfortunately Mr Straw's intention to register the donation in 2006 was not acted upon, and when Mr Straw was sent a copy of his Register entry early in 2007, he failed to notice that the donation had still not been registered," the committee's report says. "Mr Straw eventually registered the donation in December 2008 following the formal complaint made to the Commissioner by Mr Wallace," the report says. The committee say they were "surprised and disappointed that, of all Members, Mr Straw should have broken the rules" as he had taken legislation through the Commons which had as a theme the "need for transparency in political donations". Standards Commissioner John Lyon told the committee that normally he would not submit a memorandum to the committee if an MP corrected the register after unintentionally failing to register a donation. But "in this case Mr Straw's omission in 2006 to rectify his earlier failure to register the donation he received in 2004 was a matter that the commissioner felt should be reported to the committee". The committee says: "Pressure of work may explain why Mr Straw overlooked his responsibilities, but the nature of his job should also have been a constant reminder to him of the need to observe the code". "This case should... serve as a reminder to all members - and particularly to ministers and to front benchers - of the need to ensure that their register entries are kept up-to-date at all times." Responding to the report, Mr Straw pointed out that he had put the donation onto the Parliamentary record - if not the register of interests - when answering a question from Mr Wallace in 2006. He said: "I have apologised unreservedly for what the committee notes was an inadvertent oversight on my part: in the words of the Parliamentary Commissioner it was 'neither intended nor… made in bad faith'. "I accept the conclusions of the committee that the donation should have been registered on receipt, and this error has since been rectified, but also draw attention to the Commissioner's reference to my having volunteered information about the donation in a Parliamentary answer in 2006. This declaration underlines my approach to these matters."